It was cold again last night. Much of this is due to Waiouru not having front doors or a rear hatch. Moreover we can’t start the Refleks diesel stove as we are inside the paint tent. In an effort to stop Waiouru being a wind tunnel I’ve taped a sheet of brown paper over the back hatch. We’ve also started wearing another layer of clothes. Whilst on the subject of Waiouru, we have a problem with the Houdini hatches. They don’t fit! The problem is the opening in the Wilson-Tyler shell have tighter radius curves than the actual hatches which has resulted in a gap at each corner. The gap is too large to fill and the solution is to have a steel ‘collar’ plasma cut from 4mm steel. This will be screwed and glued over the existing opening with the internal dimensions of the collar the same as the Houdini hatch. The forecast was rain but despite this I went for a walk along the towpath to Burghfield Lock and then through the adjacent linear park to the Sainsburys supermarket at Calcot. Jan gave me the shopping list but other items also caught my eye (of course) whilst browsing for custard powder. The walk took me beyond Theale as I wanted another look at Garston Lock which is just east of the M4 motorway. The reason for this is Garston Lock is turf sided. Last week I walked to Newbury and passed Monkey Marsh Lock which is also turf sided. 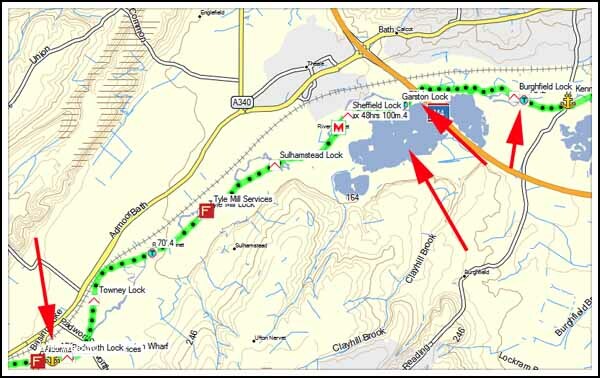 When first built, all the locks on the canal were turf sided. Garston and Monkey Marsh are all that remains. Originally the turf locks were lined on the sides with timber below the low water level. Above low water the sides slope back at 45° and lined with turf. This disadvantages with this design are the lock uses twice the normal volume of water and it’s more difficult to get on or off the boat when it’s in the lock. 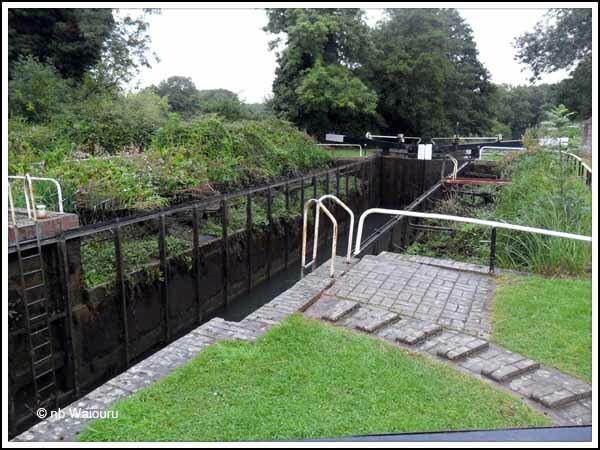 Bill (that’s local Bill who gleefully informs me of my spelling and grammar errors ) informs me these two locks were retained as part of the canal preservation and funding arrangements. 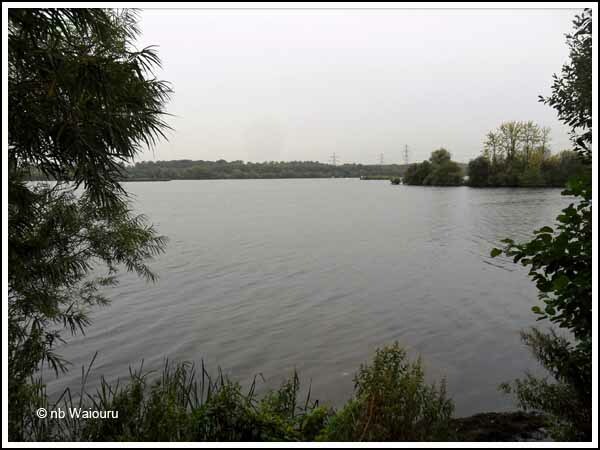 To the south of Garston Lock is a reasonable size lake (see map photo above) and there were a number of small sailboats on it despite the rain! Nick isn’t going to be doing any work on Waiouru today! He was called out to fix a broken gearbox on one of the hireboats early today. Now there is a stoppage at Ham Lock just east of Newbury which is preventing a number of the hireboats returning to Aldermaston Wharf. It’s ‘changeover’ day tomorrow so things are getting hectic! On a more smelly note I checked the toilet tank gauge this morning and it had changed to Red (full). Actually there is room for more effluent in the tank but as the boatyard was quiet we decided to do a pump out. It was also an opportunity to check the hose would reach and fit into the outlet connection on the roof of Waiouru. However before commencing the pump out the toilet was filled to the top and flushed consecutively five times in an effort to flush the pipe to the tank. It was interesting to watch the tank gauge and see how quickly the pump emptied the tank. There is a slight problem with the rinse connection. The hose will not fit down the narrow bore inside the fitting. The diameter of the hole at the cap is fine. However the diameter rapidly narrows thereafter. 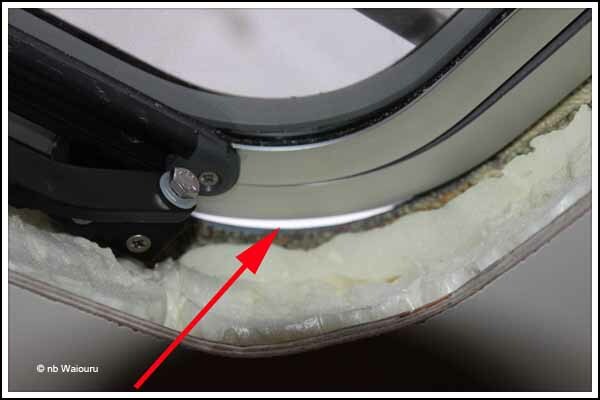 It may be possible to ‘open’ out the diameter of the hole by drilling it with a slightly larger bit or even cutting the narrow end off the fitting. Fortunately I haven’t yet glued and screwed it to the roof.